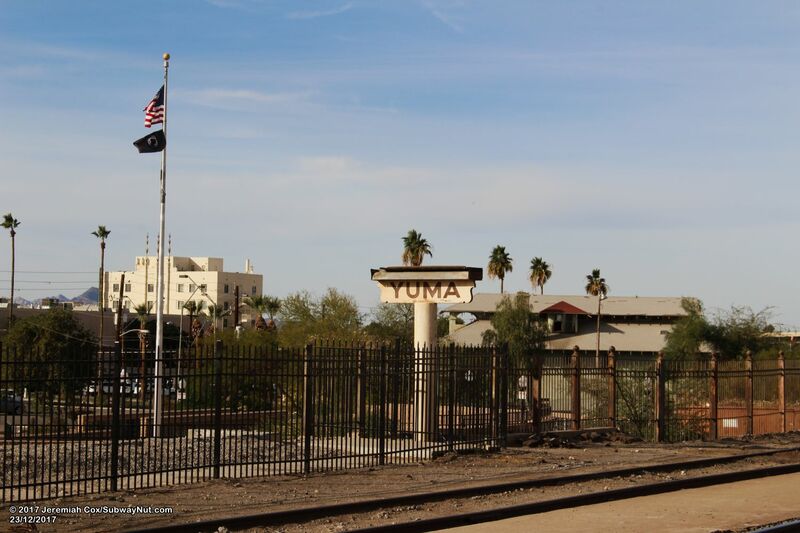 Yuma is a middle of the night Triweekly Amtrak stop on the Sunset Limited. 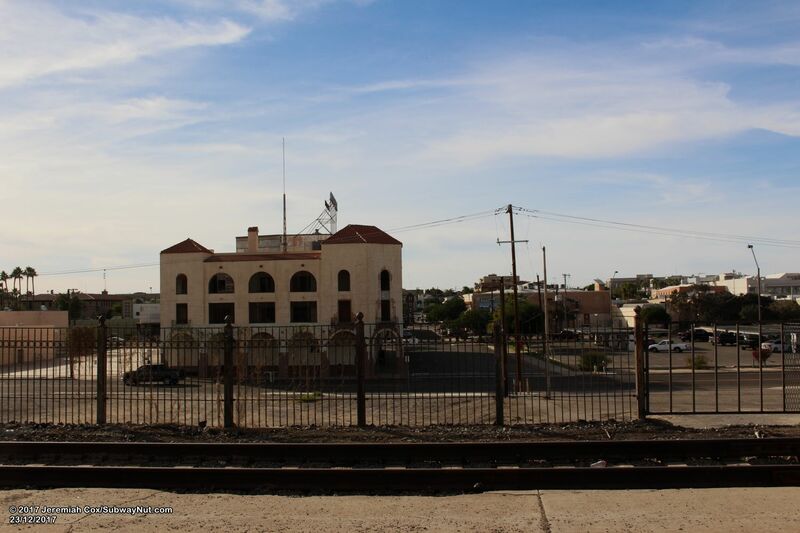 Trains stop at what barely remains of the historic 1926 Southern Pacific Station which was gutted in a 1995 fire and then torn down. 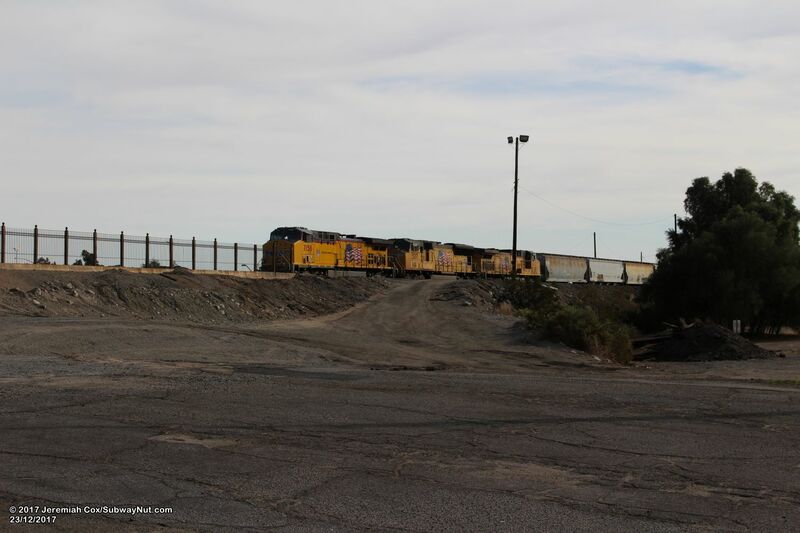 Union Pacific then built a more modular building by the station location but this has been demolished very recently (Google Street view and satellite still show the buildings up) leaving a pile of rubble where buildings once were. 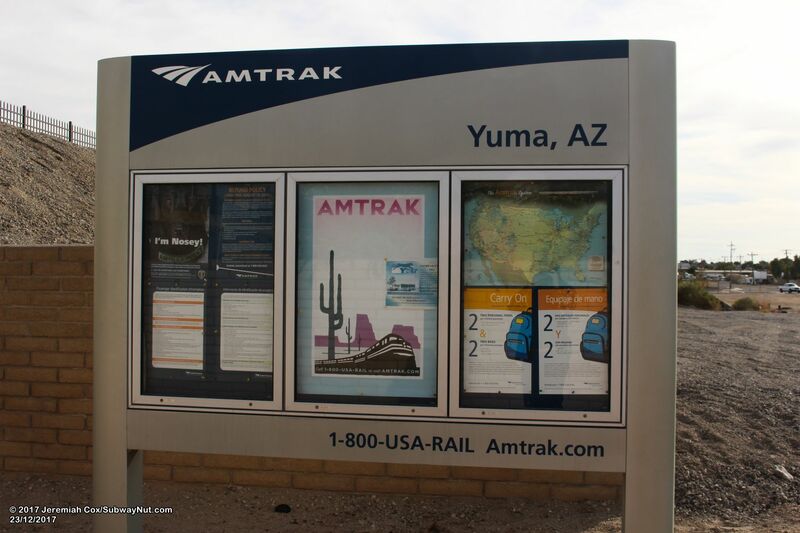 Today Yuma is a rare 'platform only' Amtrak station without even a shelter, although the tunnel to the platform could provide some cover. 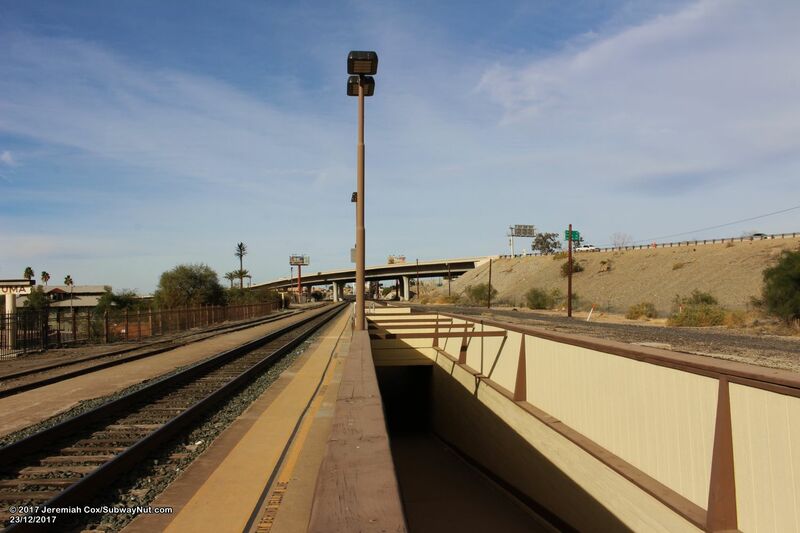 The current station consists of a low-level island platform between the northern two tracks (a third siding track begins midway through the station). 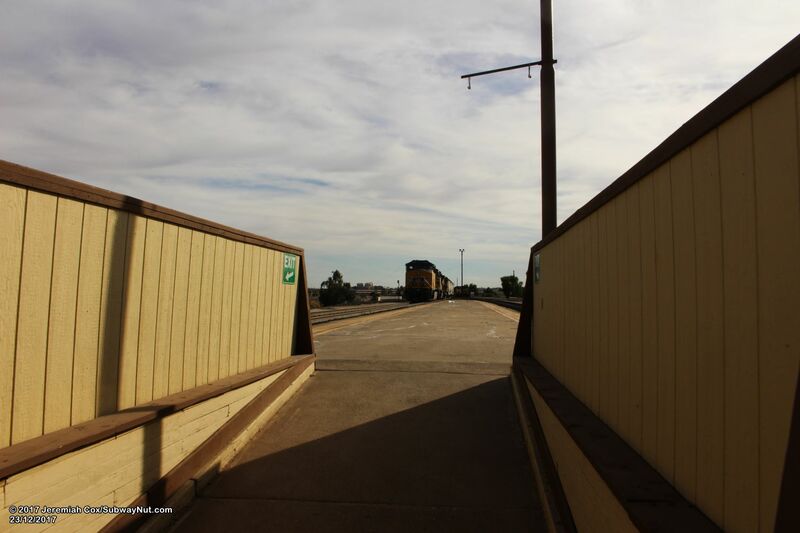 At the western end of the platform I-8 crosses the line, and the rail bridge over the Colorado River into California is also visible. 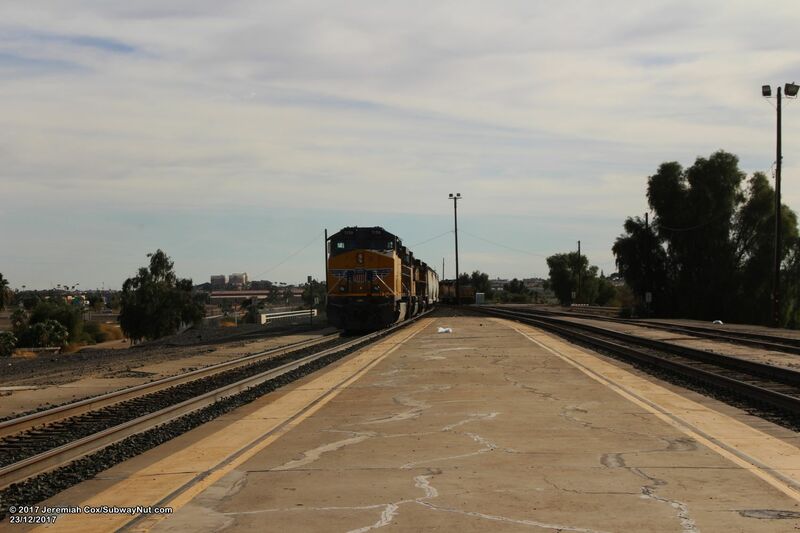 The platform has no passenger amenities on it, just a few modern lampposts and a sign that says Crew Change point, which I think is for freight trains, not Amtrak. 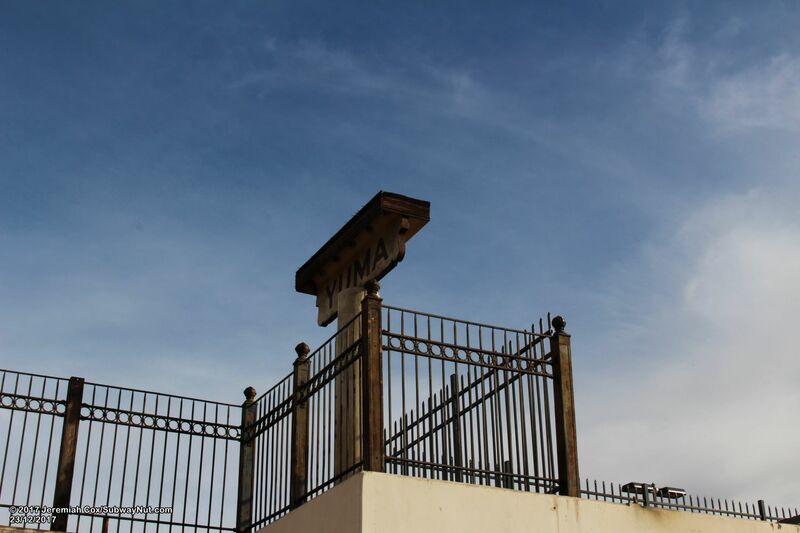 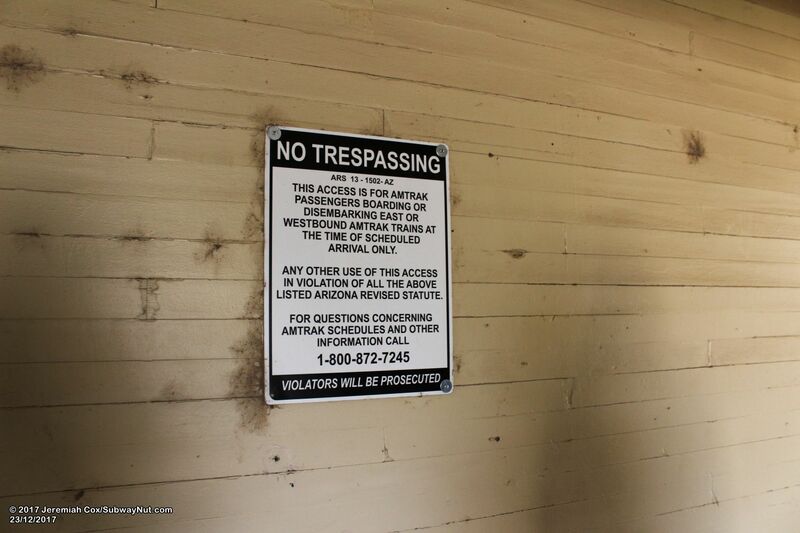 Across from the island platform, along the third non-platforming track, there are the remains of two cream colored with brown text Yuma signs that were clearly once outside the original station house. 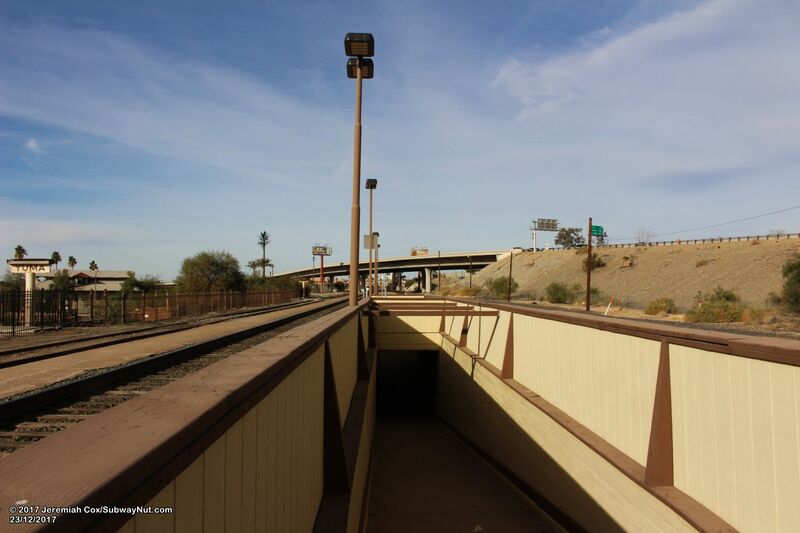 To leave the platform, two gentle ramps lead down to a historic pedestrian tunnel. 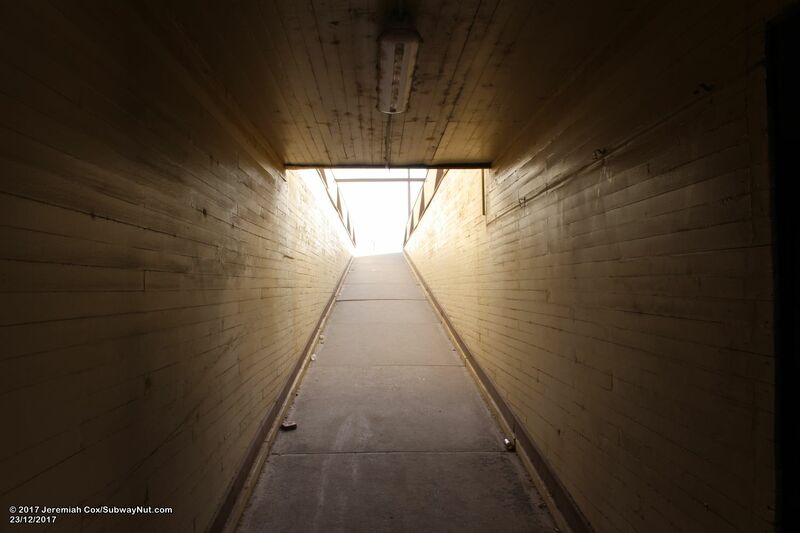 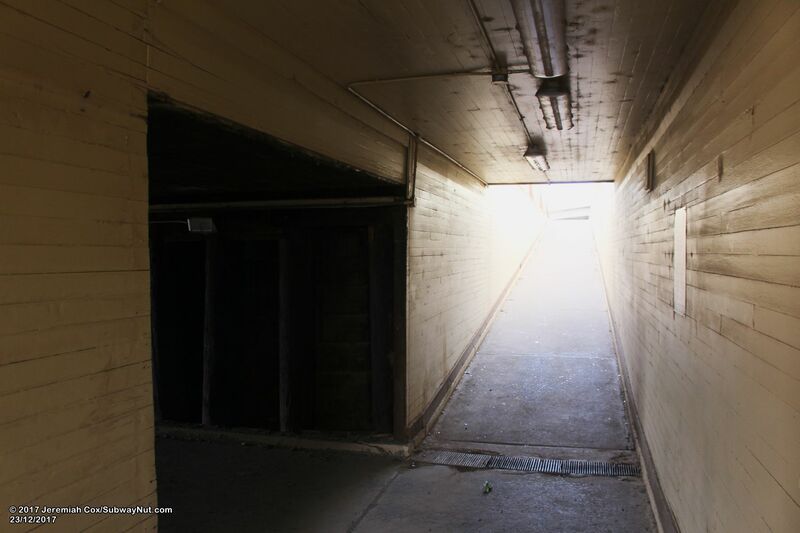 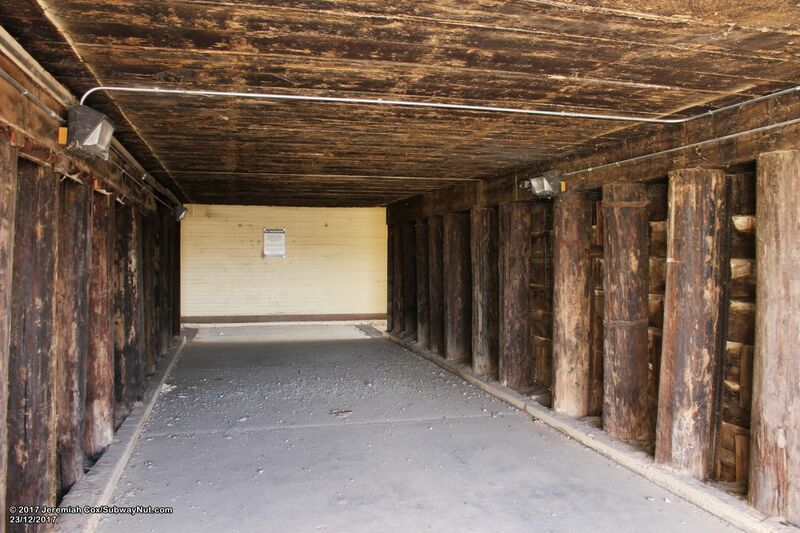 This tunnel is lined with bare wooden plank and trunk walls and a bare wood roof. 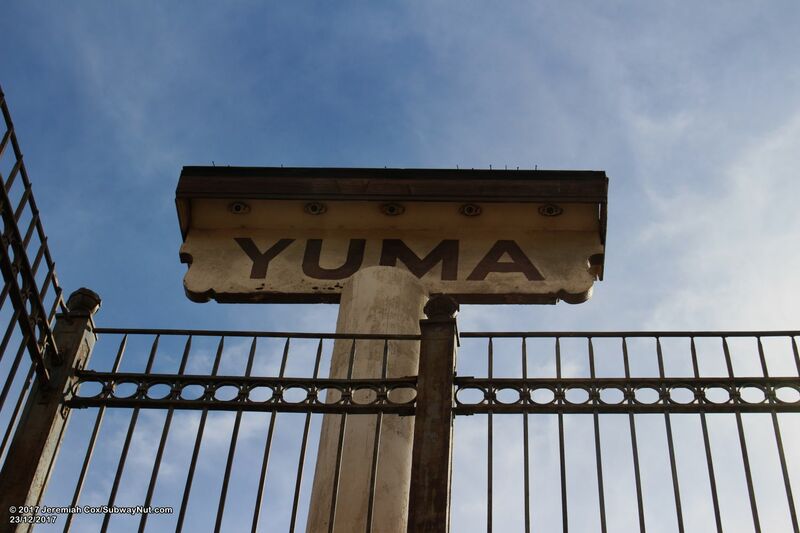 It has a musty dry smell since Yuma is in the desert. 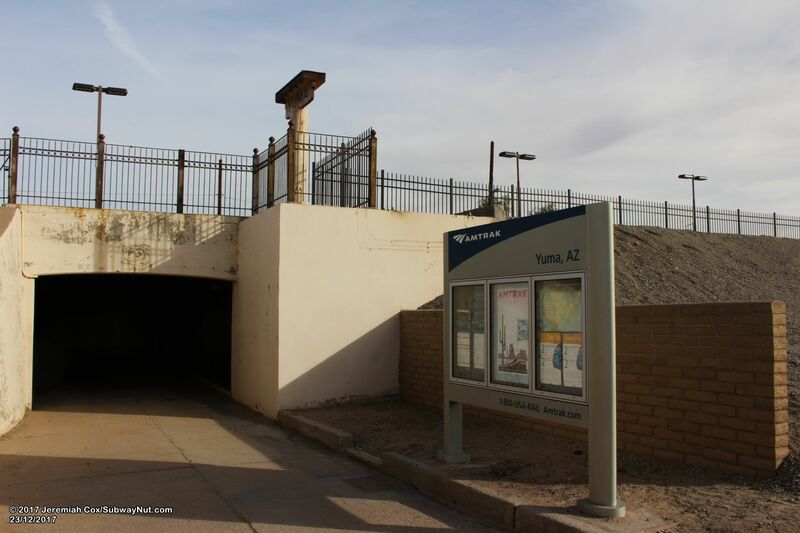 This leads out to a sidewalk and a modern Amtrak information panel. 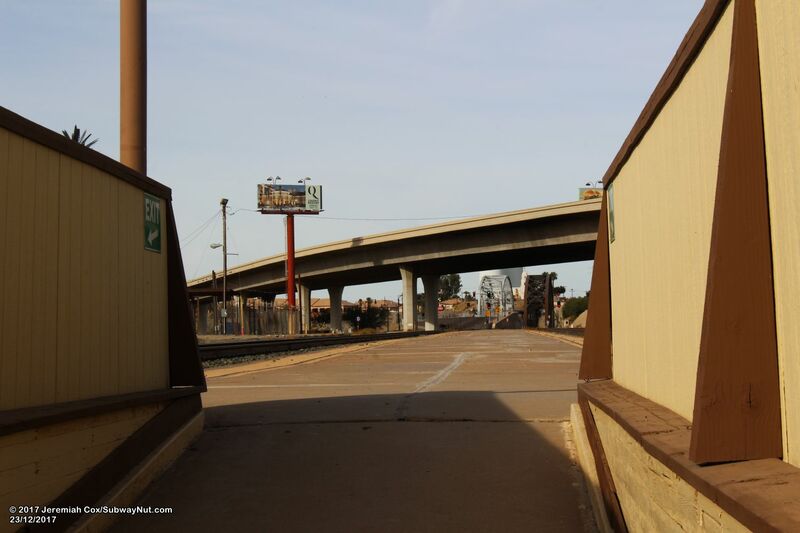 There is also a brick retaining wall. 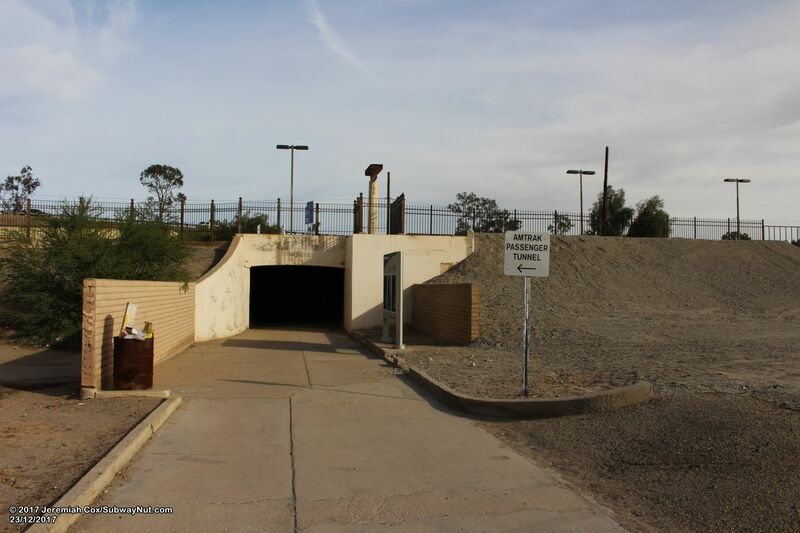 This leads out to a gravel area which could be the station's parking lot (there's no signage, Amtrak.com claims 10 long-term parking spaces), when I stopped there no cars were into the parking lot. 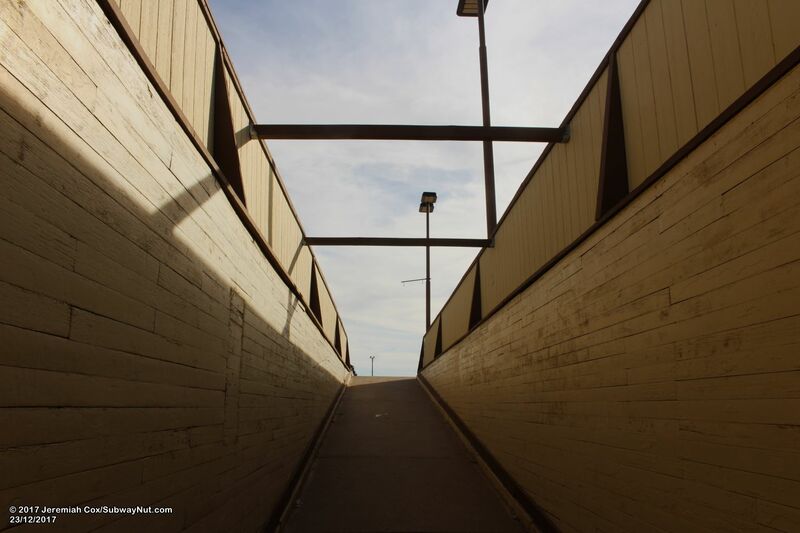 This in tern leads out to South Gila Street. 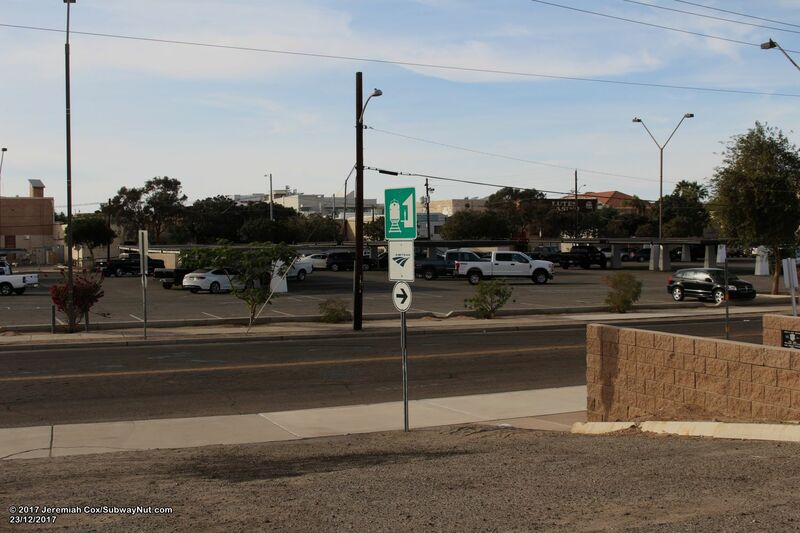 The parking area is right next to Yuma Armed Forces Park next to the station entrance sidewalk. 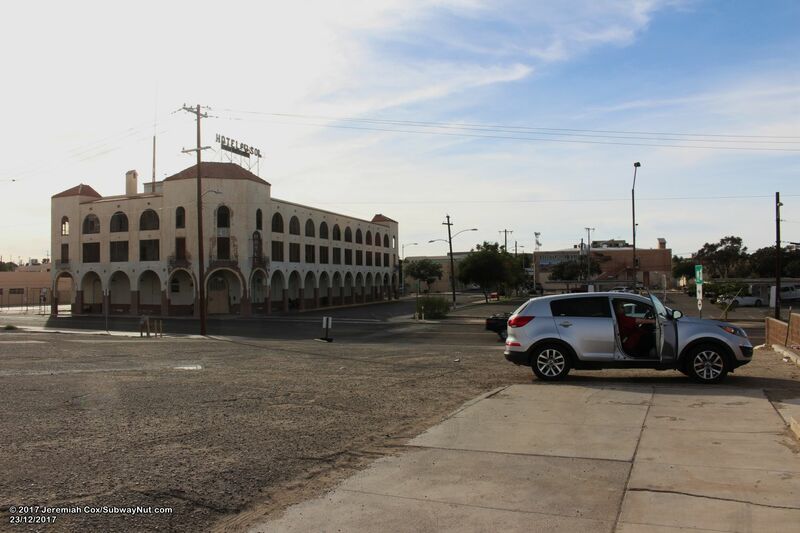 Is this car parked in the parking lot?